In this last week of summer, as we face the drying, airy time of the impending autumn, we’ll be exploring the flow of water. Come join with us at Aligned Flow at Sangha Yoga Collective, tonight at 6 pm. We’ll work on channeling the awesome power of the water element in the subtle body. New Aligned Flow Series Begins Monday September 9! 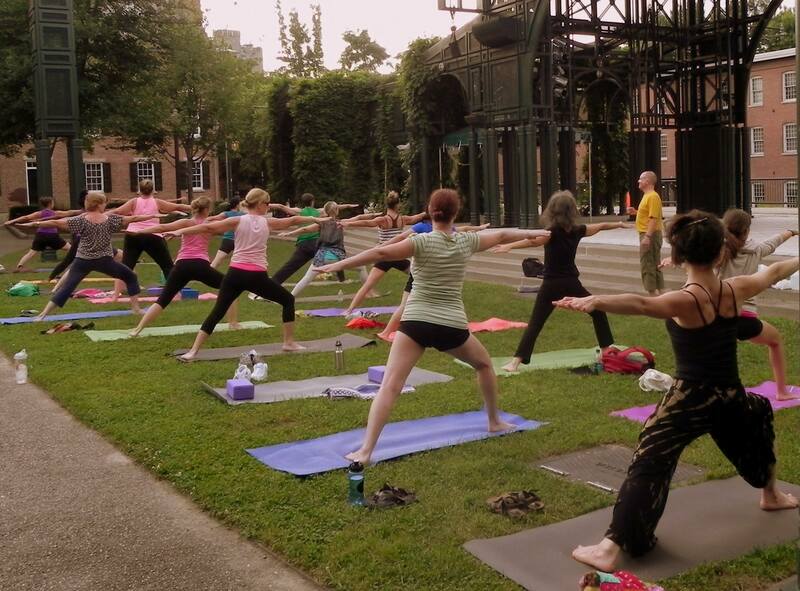 Richard teaching yoga at Boardinghouse Park in Lowell, through Sangha Yoga Collective’s “Yoga in the Park” this summer. 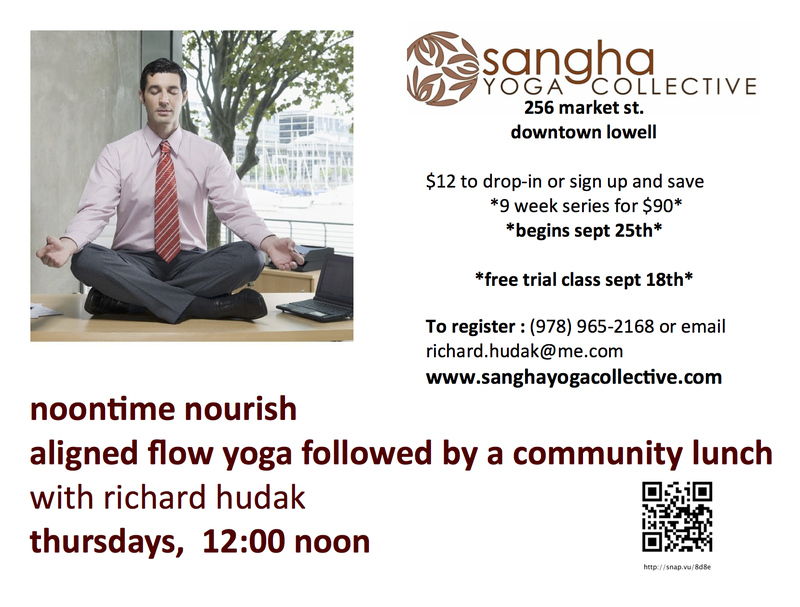 I’ll be returning to Sangha Yoga Collective on Market Street in Lowell this Fall for a six-week Aligned Flow series. Join me beginning on Monday, September 9 at 6 pm. Teaching at the University as I do, the start of the academic year is always like “New Year’s” to me. For the first class we’ll be looking at foundations of our poses, and the meaning in yoga philosophy of the number 9—meeting as we are on 9/9. I’ll be honoring the studio’s Collective Cards. Also, if you sign up for the six-week series ($72), you can save even more. Please also join us at Sangha’s Fall Open House on September 15 from 10-5 pm. I’ll be giving a free demonstration class during the Open House. I’m pleased to be continuing at Sangaha, a sweet oasis in downtown Lowell. As a student of Anusara Yoga, trained by a former Certified Anusara instructor, I’m also excited to be bringing an alignment-based flow yoga to the area. All life is flow, and alignment brings wisdom to our participation in it. 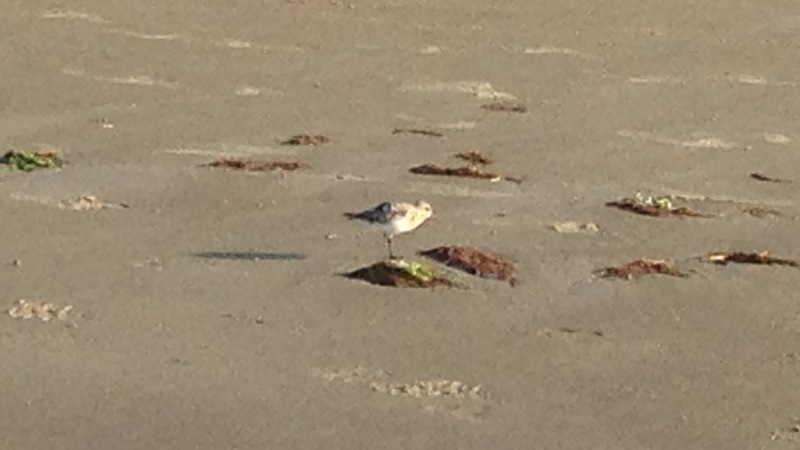 What does this one-legged plover suggest about alignment in yoga? Come to Sangha Yoga Collective on Tuesday, July 16 at 8:30 am to find out. Greetings, Friends!I’m excited to share with you that I am starting a regular class at Sangha Yoga Collective on Market Street in Lowell. In April, I completed my 200 hours of teacher training with Sara Davidson Flanders, a former Certified Anusara instructor. I got to know Sara over the course of a year in regular workshops she would give at Majestic Yoga Studio in Cambridge. I decided to start my 100 hour Anusara immersions with her in January 2012, and continued my teacher training with her in October of that year. Sara is sweet but fiery, demanding much of my āsana practice, and the practice of teaching. Even as I was completing my training, with Sara’s encouragement I began in March to offer community classes at Sangha. I’ve gotten to know some of you through those classes. I feel such a sense of peace and refuge at Sangha that I felt right at home at the front of the room. What I most would like to share at this time are Anusara’s Universal Principles of Alignment. Along with an uplifting philosophy, and the value of kula or community, the UPAs are one of the three jewels of Anusara. Even though the Anusara style is in transition, many of us still believe in these aspects of its teaching methodology. Marc St. Pierre continues to emphasize the alignment and philosophy in his teaching, as doSianna Sherman and Amy Ipolitti, with whom I have taken workshops in the past year. My six-week series will focus on the five Universal Principles of Alignment, Open to Grace (7/9),Muscular Energy (7/16), Inner Spiral (7/23), Outer Spiral (7/30) and Organic Energy (8/6). We’ll tie these all together in a potpourri class on the last day of the series (8/13). These principles work to some degree in every pose and in every practice. They also apply “beyond the mat,” to our practice in the world. Although I am offering the series as a whole for $72, feel free to drop in for $15 per class. I’m also honoring the studio’s practice of offering the “first class free” and a student discount of $10. Please feel free to forward this e-mail to friends who might be interested, even if you are unable to join us. Also stay tuned for news about a regular class I will be offering at Sangha in the fall. 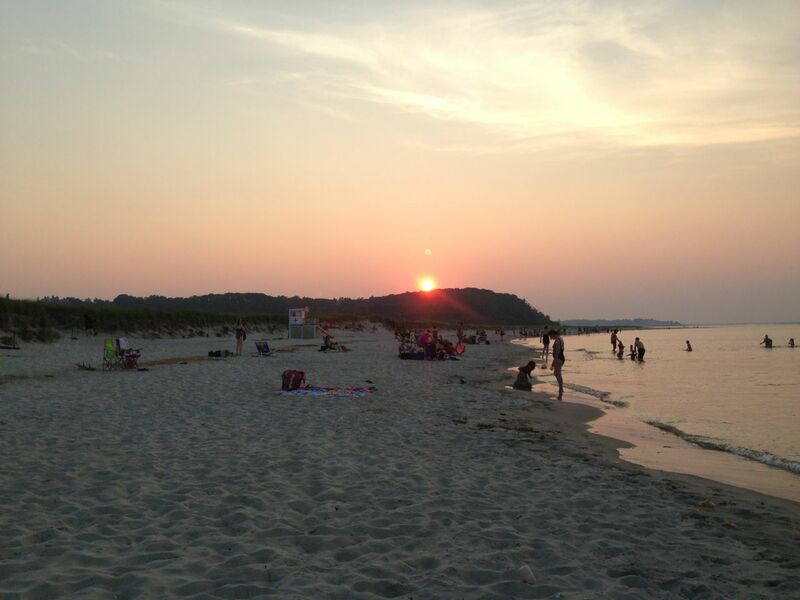 Summer is often thought of as a “slow yoga time,” and not a time to start something new. But the support, expansiveness, and other affordances of the season (like tee shirts and shorts) make it a perfect time. Besides, who doesn’t love a summer morning in a garden level sanctuary?